In a strategic and deliberate move the Cabinet, on the evening of 9th April, released the Fourth Pay Commission report on the Cabinet website along with a facebook post and tweet from the Prime Minister’s official handles. The news reports and the report itself soon went viral on social media, but the reactions from civil servants were overwhelmingly critical of the report. The minister said that the cabinet had deliberately shared the report without any changes as a part of inclusive decision making and to know the public’s views and opinions on the issue. “It is too early for the public servants to undermine what the government is doing,” said Lyonpo. He said that the government had noted that there is a lot of hue and cry on the media and social media and while the government cannot individually respond to each concern it will analyze and take into account the various feedback. The minister importantly said that the cabinet has the authority to make changes within the pay commission’s recommendations. Lyonpo said that the cabinet would be making certain changes within the pay commission’s recommendations. He said that the government can look at the salary compression, which essentially is the pay structure difference between civil servants, and also salary indexation which is the annual increment recommended by the Pay Commission up to five percent a year. 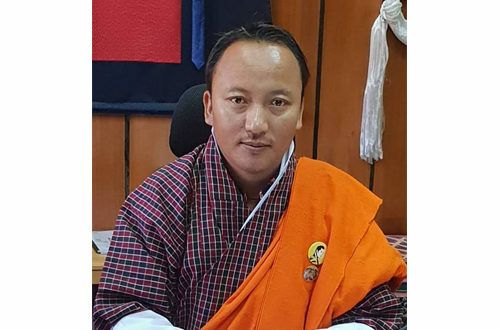 As indicated in earlier interviews to The Bhutanese, the cabinet will also look at the performance based incentive which is a financial incentive equivalent to 10 percent of civil servants’ annual pay with a five percent individual performance component and another five percent department level performance. This will start at at Nu 656 mn a year and eventually cost 877.95 mn. The incentive is already controversial among civil servants and the cabinet is likely to look if funds from this head can be reallocated to others like pay and allowances. However, while the cabinet can play around it will have a major restriction in terms of the total funds available to it. The net annual financial implication of the recommended revision of pay, allowances and benefits is estimated at Nu 4.238 billion per year. This is important because the 12th plan had budgeted only a maximum of 30 percent increase in pay and allowances. The 12th plan is already short of funds and and it will be a huge challenge to raise additional resources especially since pay and allowances have to be met from the internal revenue, as per the Constitution. The Finance Minister admitted the constraint of limited resources but he said that the cabinet has the prerogative to go beyond this 4.238 bn if need be. He said the internal revenue will have to be enhanced for this. The Finance Minister said that people were only looking at the pay but if they noted the 10 percent performance incentive, 7 percent PF and house rent allowance the total hike would be more than 30 percent. 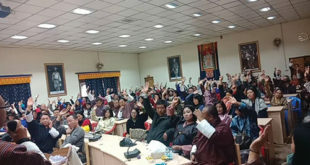 Lyonpo said that the cabinet’s final report on the pay commission will be out by the third week of April. The need for the cabinet to discuss the issue in depth and the four-day state visit of Lyonchhen and the Foreign Minister to Bangladesh will mean that the cabinet requires some time. The Pay Commission in its reports states that it had sough some Constitutional interpretation from the OAG in its report, and the OAG’s two main conclusions were that the cabinet has the final authority and secondly that the report is not a money bill and so has to be presented as a report in the Parliament. This also means that the Parliament cannot substantially alter the report of the Pay Commission though it can make a few changes. The main grouse of civil servants seem to be with the lower than expected percentage of basic salary hikes for civil servants which are between 14 percent and 21 percent. MPs, Ministers, Constitutional post holders and senior Judges were recommended to get a 14 percent hike. The Elementary Support Personnel who are outside the civil service but are public servants are recommended to get a 29 percent hike while similarly the General Support Personnel get a 23 percent hike. 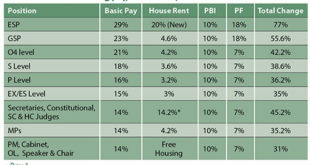 Many civil servants felt that that hike structure did not do enough to reduce the income gap. 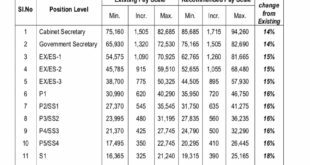 Many pointed out that the 14% hike for senior executive level civil servants would mean a Nu 10,000 hike while a 21 percent hike at lower level like Operational staff meant around Nu 1,790 hike. Many civil servants pointed out that the smaller actual hikes for lower level civil servants would be wiped out in rent increases and inflation. Quite a few civil servants raised issues with higher House Rent Allowances of 71% of the existing HRA for higher ranked civil servants like government secretaries and also constitutional post holders. The report recommended that the HRA of government secretaries and Constitutional post holders be increased from 20% of basic pay to 30% of basic pay. Here again, a comparison was made with the actual increase in the amount than the percentage. Other issues which came up were in terms of big difference in the amounts in the monetization of the vehicle quota with Nu 1.5 mn proposed for Minister, MPs, Constitutional Post holders and government secretaries while those for civil servants was at Nu 250,000. People also brought up increase fuel and driver allowances for MPs. Some questioned why they were not eligible for allowances being given to others like health allowances for health staff while health technicians also pointed out that they also need the on-duty allowance as they have to support doctors. A few brought up the reduction in the travel mileage from Nu 16 to Nu 10 per km but there were also others who appreciated the reduction and also making it uniform for all. The increase of the Kabney allowance from Nu 100 per month to Nu 10,000 per month was questioned in terms of the monetary increase. Similarly, various other aspects of the report was discussed and also criticized. 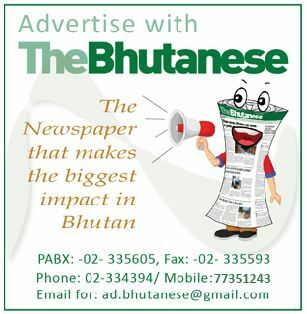 The Bhutanese has found that when one factors in the increases in basic pay, provident fund and house rent and along with it the new performance based incentive the actual overall hike is much higher but it also rises income inequality (see main story on pg 1).